For Somerville this was a kind of pilgrimage, a journey unlike any he had undertaken in 20 years of travel writing. It was an expedition where he traded the usual comforts and certainties for a real physical and mental challenge, with no mobile phone or other technological aids. The only plan for his journey was to begin in the East at Easter and finish at Whitsun in the extreme West, at the Monastery of the Golden Step, whose gold step, legend says, can only be seen by those who have purged themselves into purity. During his 300-mile walk, he tackled four mountain ranges, high slopes and the numerous gorges of the West. 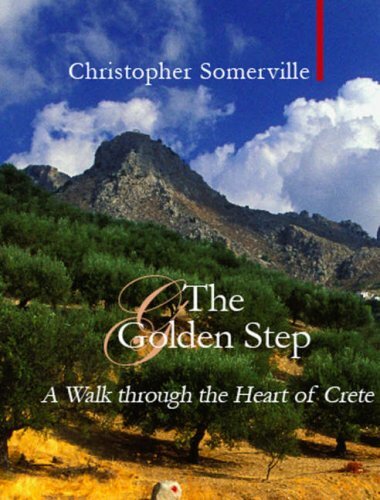 Speaking only basic Greek and trying to follow a poorly way-marked path, he had to rely on his own instincts when climbing mountain passes and crossing high plateaux, farming and shepherding country, where villages are scarce and each night’s accommodation was uncertain. He saw a Crete few ever encounter. Christopher Somerville is a writer, journalist and presenter. He was Walking Correspondent of The Daily Telegraph for 15 years. He is the author of Britain and Ireland’s Best Wild Places and Somerville’s 100 Best Walks.